And it pretty much did. The breeze was blowing straight out of the city so the buildings were making for some very random wind shifts. It was all about staying calm, never giving up and focusing on our processes not the results. It seemed to work. We sailed really well as a team and kept cool heads in tough situations. After seven hard races we ended up with a score line of: 2,9,1,3,2,2,5. This gives us a narrow lead over the fleet. But as we all know there are a LOT more races to come! Today we also paid tribute to Olivia Constants who lost her life last week in Annapolis when her 420 capsized during a sailing camp. She was only 14 years old. We were all touched by her story. Terry lives in Annapolis and is very active in local sailing there. So we cut up a bunch of black sticky-back and gave a black ribbon to every Extreme 40 team. All 11 boats sailed today with a black ribbon flying off the back of our mainsails in memory of Olivia. We will be racing again tomorrow from 1400-1700 and for the next three days. The event ends on the 4th of July which is a huge celebration in the USA. We will be working to make sure we have our own celebrating to do as well! 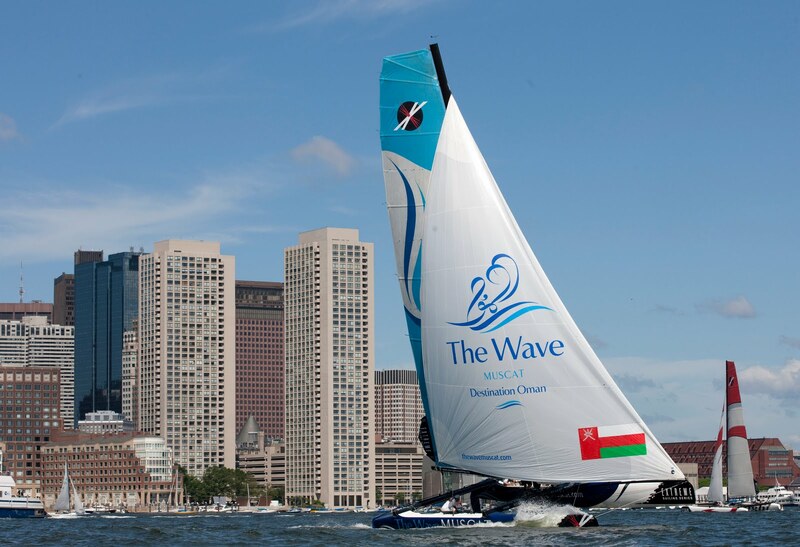 The Extreme Sailing Series Boston got off to thrilling start today, with a fantastic opening day for Oman Sail’s The Wave Muscat. Three race wins was enough for the team to finish the day in second place, just one point off first placed Artemis Racing from Sweden. For Oman Air, a well fought battle mid-fleet see’s them finish today in eighth place. 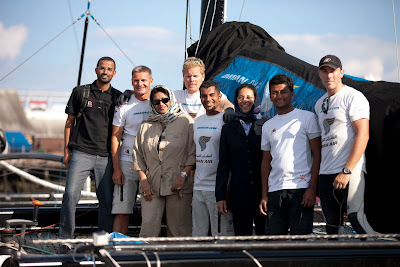 Showing their support for the Omani teams today were Her Excellency Hunaina Al Mughairi, Oman's Ambassador, in the USA, and Her Excellency Lyutha Al Mughairi, Oman's Ambassador for the United Nations, who were both impressed to see the Oman Sail Extreme 40’s in action for the first time. The competition was fierce on the water today, and the team on Oman Air found themselves in a battle mid-leader board with Emirates Team New Zealand, Alinghi (SUI) and Team NiceforYou (ITA), all of which are skippered by experienced America’s Cup sailors. After a hard fought battle, they finish today in eighth position overall, an impressive seven points clear of Alinghi. At the end of today, it is the Swedish team of Artemis Racing who finish at the top of the leaderboard, with Red Bull Extreme (AUT) five points shy ofThe Wave, Muscat in third place. The current Series leaders, Groupe Edmond de Rothschild (FRA) finish today in fourth. There are four more days of racing left in Boston, before the event draws to its conclusion on the 4th July. The event here is part of the Boston Harbourfest, the largest the Fourth of July celebration in the United States, with huge crowds expected to descend on Fan Pier to watch the racing during the weekend. 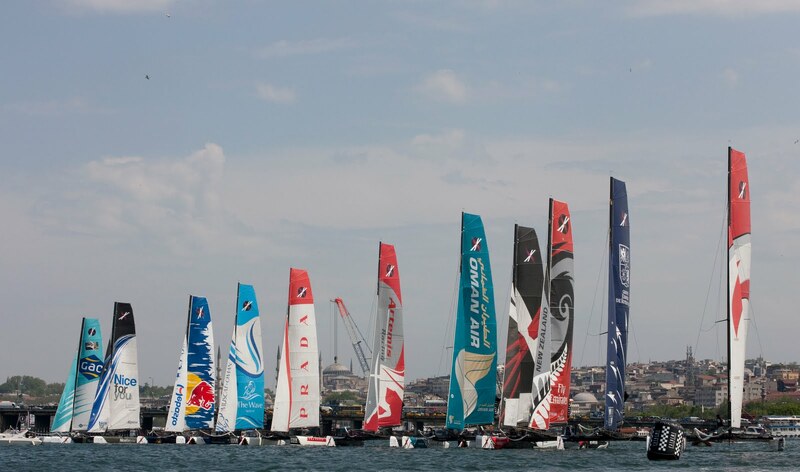 After the event in the USA, the Extreme Sailing Series will travel to the UK, Italy, France, and Spain, before it’s conclusion in Singapore in December. 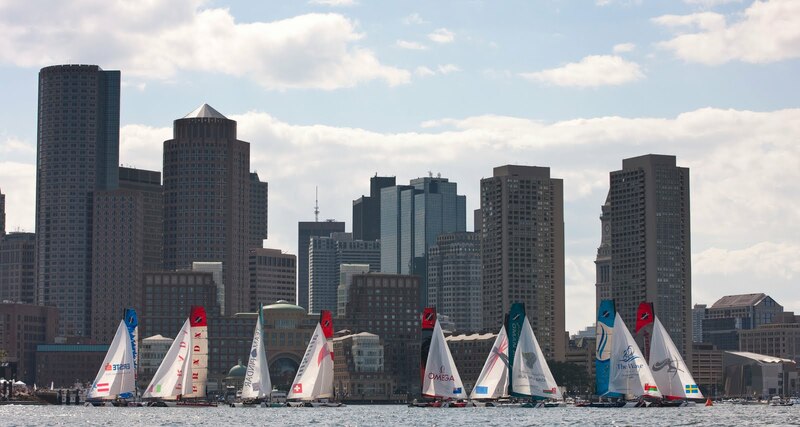 The opening day of the Extreme Sailing Series™ Act 4 at the Fan Pier in Boston proved to be a challenging one as the 11 Extreme 40 teams made their USA debut. Finding the best lanes of pressure and speed was the big ask of the day as the breeze fluctuated in strength and direction with the Fan Pier backdrop throwing in some wind holes for good measure, especially at the finish area only metres from the shore and the crowds. The Wave, Muscat. Image copyright Mark Lloyd/Lloyd Images/OC ThirdPole. Roman Hagara’s Red Bull Extreme Sailing pulled off two race wins in the final two races and consistency in the earlier races secured third place overall going into the second day. 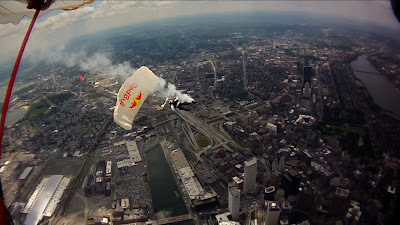 No doubt his team was inspired by the Red Bull Air Force skydivers who provided a stunning opening stunt to kickstart racing. The two parachutists performing loops on their descent, releasing smoke flares before landing on the floating pontoon right in front of the crowds with impressive precision. Extreme 40s racing off Fan Pier, Boston. Image copyright Mark Lloyd/Lloyd Images/OC ThirdPole. Spectators at Fan Pier, Boston. Image copyright Mark Lloyd/Lloyd Images/OC ThirdPole. Red Bull Air Force sky divers. Image copyright Mark Lloyd/Lloyd Images/OC ThirdPole. L'arrivée au port de Calais n'a pas été des plus appréciées par nos régatiers : des fichiers météo qui se contredisent, une petite heure de spi, et le reste du parcours au reaching et au rappel ... Nos équipiers n'ont malheureusement pas su tirer leur épingle du je, et arrivent 10ème à Calais. Le départ a été difficile : le vent ne correspondait pas aux attentes de Fabien Delahaye, navigateur du bord, et le Toulon Provence Méditerranée se retrouvait bloqué. Après la bouée de dégagement, certains prenaient l'option très audacieuse, mais payante, du large, et d'autre empannaient de suite. TPM, gêné par des concurrents, ne pouvait les suivre et restait au milieu. Les places étaient chères sur ce coefficient 2, et les M34 ne lachaient rien. 14ème et avant dernier de la flotte au pointage de minuit, Fabien Henry et ses hommes bataillaient ferme et remontaient jusqu'à la 10ème place ce matin. Ile de France remporte sa deuxième étape consécutive devant Oman Sail et Crédit Mutuel Bretagne. Aujourd'hui, la flotte du Tour de France à la Voile est au repos pour récupérer de cette nuit, et se préparer aux parcours bananes de demain matin. Fire hydrant conditions on board CAMPER ETNZ. Image copyright Hamish Hooper/CAMPER/Volvo Ocean Race. Chris Nicholson's team enjoyed a wild offshore testing trip. But is "enjoy" really the word for Media Crew Member Hamish Hooper? He describes facing the "constant wall of water" in his blog. “Will Oxley’s forecast was for a nice sail testing out past Great Barrier Island and through the night to the north east of East Cape,” Hamish writes. Stu Bannatyne shifting the stack. 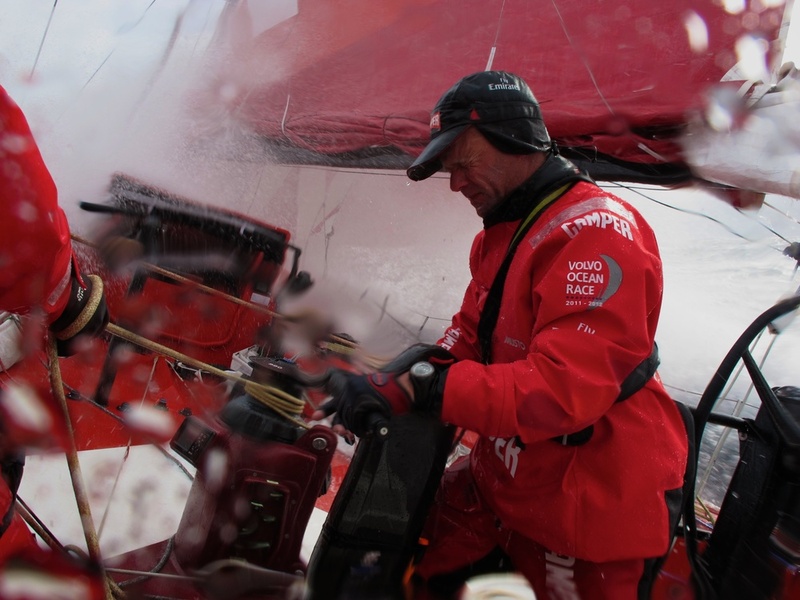 Image copyright Hamish Hooper/CAMPER/Volvo Ocean Race. The wet and cold part was right but otherwise Hamish was in for a surprise. “Again, as always Will’s report is spot on - well almost. The bit about the sitting around resting in light wind for 12 hours or so, that didn’t happen, as the southerly blast was more intent on smashing its way up the country quicker than expected. Full CAMPER crew with aft stack, during offshore testing. 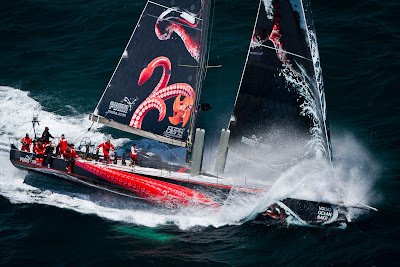 Image copyright Hamish Hooper/CAMPER/Volvo Ocean Race. "Luckily I had quite a good sleep, and loaded up on a new seasick remedy to prepare for the trip home. That morning to add to my apprehension Mike Pammenter flippantly commented, 'You haven’t experienced anything yet, Hoops. Today is what I call sailing in fire hydrant conditions.' I asked myself what that was supposed to mean. "An hour later I got a pretty clear impression of what he meant - as clear as a spade to the head, or in this case a constant wall of water to the face." Hamish had already been through some rough sailing onboard CAMPER with Emirates Team New Zealand. This day of testing was another experience he will definitely remember. “It was quite a ride back to Auckland. Nico, Stu and Chuny all went nuts on the wheel. Now I understand a frequently used term 'sending it'. Laird Hamilton paddle-boarding alongside Mar Mostro. Image copyright Megham Sepe. 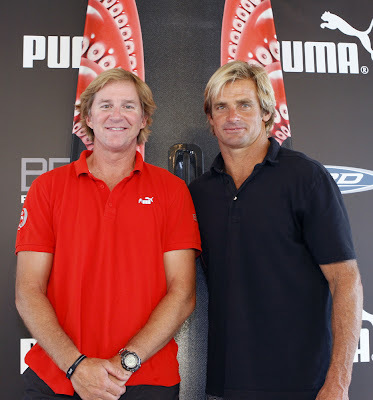 PUMA Ocean Racing powered by BERG Propulsion today introduced Laird Hamilton, big wave surfer and father of modern stand-up paddleboarding, as the honorary 12th crew member of the PUMA Ocean Racing team. Through this unprecedented partnership, PUMA and Hamilton will join forces in two arenas: 1) to search for the world's biggest, ride-able waves and 2) to launch a line of innovative stand-up paddleboards. Additionally, PUMA revealed an ocean preservation campaign, spearheaded by new mascot, educator and honorary 13th crew member, Marmo. Hamilton prepares for his role as the honorary 12th member of PUMA’s ocean racing crew. PUMA and Hamilton will join forces to search for the world’s biggest, ride-able waves and to launch innovative stand-up paddleboards on Tuesday, June 28, 2011. 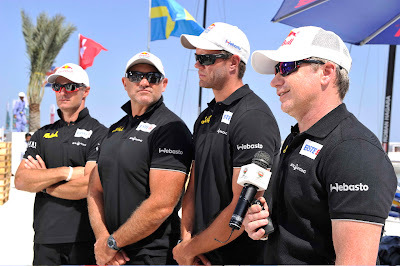 Hamilton together with the PUMA Ocean Racing Crew will commence a search for the world’s monster waves during the upcoming Volvo Ocean Race 2011-2012. Skipper Ken Read and the crew aboard PUMA’s Mar Mostro ( ‘The Monster of the Sea’ in Italian) will help track the world’s biggest rogue waves which Hamilton will attempt to conquer, getting him one step closer to achieving his life-long ambition of “riding giants.” Using the weather and navigational teams onshore and onboard PUMA’s Mar Mostro, the crew will track wave patterns while sailing through the remotest reaches of the world’s oceans. As monster waves are found, Hamilton will fly in, prepared to surf them. The key to Hamilton’s success in riding the world’s wildest waves rests on an innovative new “concept” surfboard by the same design team that brought PUMA’s Mar Mostro to life. Juan Kouyoumdjian (Juan K), the mastermind behind PUMA’s Mar Mostro Volvo 70, as well as the boat designer for two previous winning Volvo Open 70 boats, ABM-AMRO ONE and Ericsson 4, will collaborate with Hamilton on the surfboard development. Laird Hamilton and Mar Mostro. Surf and stand-up paddleboard sensation, Laird Hamilton, paddleboards alongside PUMA’s Mar Mostro, the ocean racing yacht competing in the Volvo Ocean Race 2011-2012. Hamilton prepares for his role as the honorary 12th member of PUMA’s ocean racing crew. PUMA and Hamilton will join forces to search for the world’s biggest, ride-able waves and to launch innovative stand-up paddleboards on Tuesday, June 28, 2011. 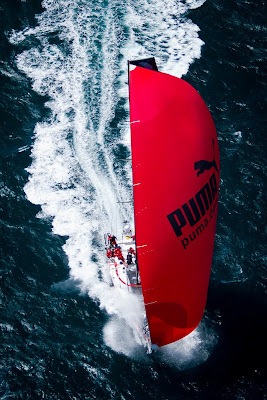 Image copyright Megham Sepe/PUMA. Laird’s latest passion is paddle surfing, a sport he’s helped make popular worldwide with water sports enthusiasts of all ages and abilities. PUMA saw an opportunity to extend the Juan K - Laird Hamilton design partnership beyond a concept surfboard and into a range of stand-up paddleboards for consumer use. These limited edition carbon fiber stand-up paddleboards (SUPs) will take inspiration from the Mar Mostro Volvo 70 hull design, both ergonomically and through the use of the same ultra-lightweight carbon fiber materials. 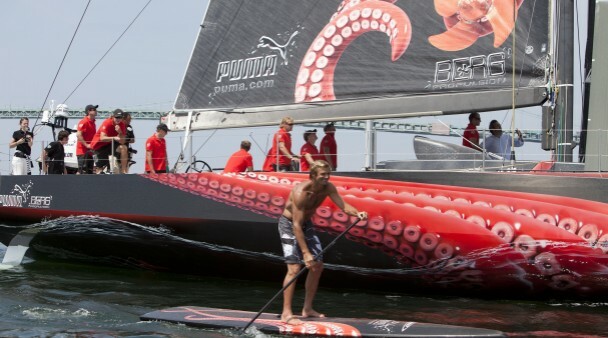 Made in the United States, the boards feature the bright red tentacle design, matching PUMA’s Mar Mostro. This marks the first time that boat hull design innovation will be applied to paddleboards. The PUMA/LAIRD SUPs are set to debut to the trade at Outdoor Retailer this August in Park City, Utah (USA), with broader consumer availability in time for the Volvo Ocean Race Start this November. 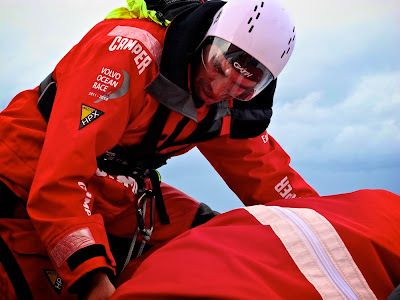 As the honorary 12th crew member, Hamilton will also serve as a fitness and nutrition coach for the PUMA Ocean Racing team, applying his proprietary regimen to get the boys ready to face mother nature’s fury at sea. Hamilton’s fitness routine varies based on the conditions, but he believes a program should be both functional and fun. He focuses on building speed, strength and endurance through specialized circuit training in the gym. Hamilton also practices yoga and uses his “anywhere workout” for exercising in different locations – from the beach to a hotel room. After working up an appetite, Hamilton’s diet centers on eating for performance, health and, of course, pleasure. 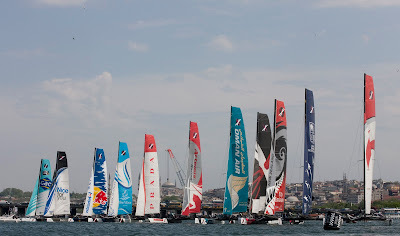 The PUMA Ocean Racing team is once again under the leadership of Ken Read (Newport, Rhode Island, United States). The core includes: Tom Addis, Navigator (Sydney, Australia); Ryan Godfrey, Trimmer & Driver (Adelaide, Australia); Kelvin Harrap, Trimmer & Driver (Napier, New Zealand); Brad Jackson, Design Coordinator & Watch Captain (Auckland, New Zealand); Rome Kirby, Trimmer & Driver (Newport, Rhode Island, USA); Michael “Michi” Müller, Bowman (Kiel, Germany); Tony Mutter, Aerodynamics Coordinator & Watch Captain (Auckland, New Zealand); Casey Smith, Systems Manager & Bowman (Brisbane, Australia); Jonathan “Jono” Swain, Helmsman & Trimmer (Durban, South Africa); Arden Oksanen, Media Crew Member (Jackson Hole, Wyoming, USA); Kimo Worthington, General Manager (Portsmouth, Rhode Island, United States); and Tim Hacket, Shore Team Manager (Sydney, Australia). The management and sailing team for PUMA Ocean Racing shares a level of success difficult to match with 22 Volvo Ocean Race entries and 20 America’s Cup editions. 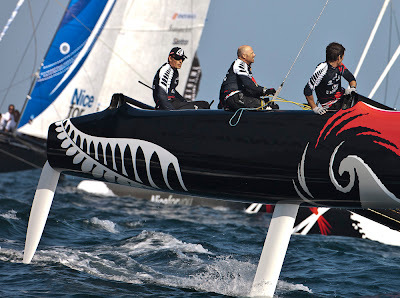 Collectively, the core team holds seven 24-hour mono hull speed records and has won the Around the World Race seven times. Laird Hamilton and Mar Mostro. 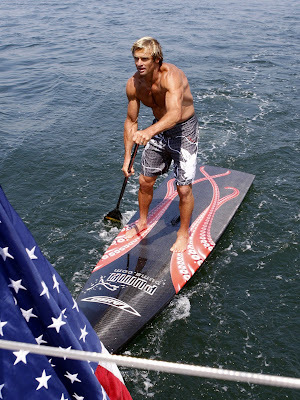 Surf and stand-up paddleboard sensation, Laird Hamilton tries out his new innovative, custom designed PUMA paddleboard in Newport, R.I., Harbor. Earlier in the day, Hamilton was named PUMA Ocean Racing's honorary 12th crew member for the Volvo Ocean Race 2011-2012 on Tuesday, June 28, 2011. Image copyright PUMA. In keeping with PUMA's long-term commitments to sustainability, for the upcoming Volvo Ocean Race, PUMA will reach out to young sailing and sports fans to raise awareness and learn about the importance and shared responsibilities of ocean preservation. PUMA's environmental campaign will be fronted by Marmo, a specially created “sea monster” mascot who's identity was inspired by PUMA’s Mar Mostro. Marmo, PUMA's honorary 13th crew member, will be the face of PUMA's ocean conservation efforts aimed at young children. His adventures will be featured in a children's book, available this fall that teaches youngsters what they can do in their daily lives to help protect marine resources. Additionally, Marmo will be the star of a comprehensive educational campaign that includes family events in port stop-overs, and online activities including practical tips, games, quizzes and more. Children can follow Marmo on his journey with the PUMA Ocean Racing team online. 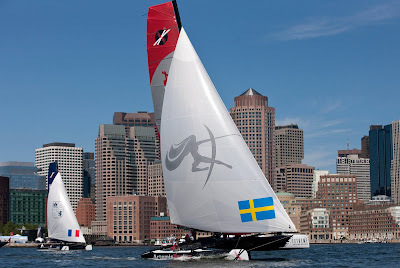 Extreme 40 : How Long Does it Take to Rig an Extreme 40 in Boston? America's Cup : Going Extreme with ORACLE Racing! 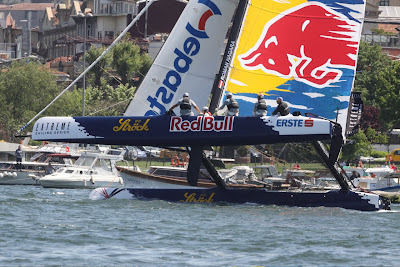 Red Bull Extreme Sailing. Image copyright Sabine König. Ab Donnerstag 14 Uhr (Ortszeit) startet Red Bull Extreme Sailing vor der Skyline von Boston in den vierten Stopp der Extreme Sailing World Series 2011. Das unter österreichischer Flagge startetende Team mit Skipper Roman Hagara , Taktiker Hans Peter Steinacher (beide AUT), Will Howden (UK) und Craig Monk (NZL) ist nach drei von neun Saisonrennen am 20 Meter hohen und 14 Meter langen Karbon-Katamaran in der Weltelite angekommen und zählt in Boston zu den Mitfavoriten. Das Finale des US-Rennens findet am 4. Juli, dem Amerikanischen Unabhängigkeitstag, statt. Am Dienstag kam der bis zu 75 km/h schnelle Extreme 40 Multihull der Österreicher in Boston an, am heutigen Mittowchnachmittag findet das erste Training statt. Start für den ersten von fünf Renntagen ist am Donnerstag (30. Juni) um 14 Uhr Ortszeit. Bei bislang drei Events in Muskat (0man), Qindao (China) und Istanbul (Türkei) gab es drei Sieger: Groupe Edmond de Rothschild in Muskat, Luna Rossa in Qingdao und Artemis Racing in Istanbul. Emirates Team New Zealand war in Istanbul ganz nah dran und will unbedingt gewinnen. Sie bringen ihren America’s-Cup-Strategen Adam Beashel als Taktiker mit. Und trotz ihres Crashs in Istanbul, wird Alinghi mit dem Vorjahreszweiten Yann Guichard immer besser und hat das Podium im Visier. Red Bull Bowman Craig Monk (NZL): „Die Serie ist extrem ausgeglichen. Es hat sich kein Top-Favorit herauskristallisiert. Wir sind von der seglerischen Performance sicher ganz vorne dabei.“ The Wave aus Muskat hat mit dem Briten Leigh McMillan einen neuen Skipper, der dazu beitrug, Ecover 2010 auf Platz drei zu segeln. Erstmals wird in Boston das komplette Renngeschehen der Extreme Sailing Series live im Internet übertragen. Erreichbar via www.sailinganarchy.com. Die Wettervorhersage sagt für Samstag, den 2. Juli, mit 13 bis 15 Knoten und Böen den stärksten Wind vorher. 6 Knoten genügen, um die rund 1300 kg schweren Karbon-Multihulls „fliegen“ zu sehen. The best sailors from all over the world own the sea area offshore Warnemuende again from the 2nd to the 10th of July. Around 1,500 active participants from over 20 nations compete in 17 boat classes. Additionally, the offshore program in Warnemuende offers the ultimate sailing experience to the 500 participants. The This year's center of the sportive part is the recently renovated marina Mittelmole, locations with special highlights are the marina Hohe Düne and the beach, where spectators can watch the International German Junior Championship of the BIC Techno Surfer as well as the sailors of the paralympic boat class 2.4mR. Being in top form and after a successful completion of the Kieler Woche, the second elimination regatta in the battle for the Olympia tickets determined by the German Sailing Association (DSV), Laser Radial sailor Franziska Goltz starts in Warnemuende. Franziska, who is originally from Schwerin, asserted herself against other top-class competitors during the Kieler Woche and ended up in fourth place in the overall ranking – only three points were missing to get bronze. In addition, she is the best German female sailor of her class and the Olympia ticket is just one step away, now. Her current top form can be witnessed in Warnemuende from the 2nd to the 5th of July during the Laser Europa Cup in the Laser Radial - which is Olympic for women. She competes against 120 other Laser Radial sailors. "A lot of my competitors are participating in the European Championship in Helsinki, which takes place simultaneously to the WARNEMÜNDER WOCHE. But I rather want to start here, because it's just so much fun and something very special to me. ", the 25-year old athlete explains. Also, the Laser Standard and 4.7 mobilizes a lot of participants. In total 250 Laser sailors compete against each other, this year on three tracks. Another sportive highlight right at the beginning of the event is the International German Junior Championship of the surfer newcomer class BIC Techno. Around 30 board stars are competing for winning this Championship. Their base camp is at Warnemuende's beach just right at the lighthouse. The paralympic keel boat 2.4mR has been recently included to the program in the rather familiar sailing event. This ranking list regatta with open rating system - meaning athletes with or without a disability compete with each other equally – starts on Friday, the 8th of July, and finishes on Sunday, the 10th of July in 2011. In order to get to know the class and the very exciting races, sailing takes place close to the audience directly at the beach. The marina Hohe Düne with its barrier-free swimming jetties and sanitary facilities is the main base of the 2.4mR sailors. Interested spectators or wheelchair users can get active in a further handicapped accessible boat: a capsized-proof trimaran can be used for a trial sailing tour. is also a newcomer class this year. A top event initiates this premiere at the WARNEMÜNDER WOCHE. 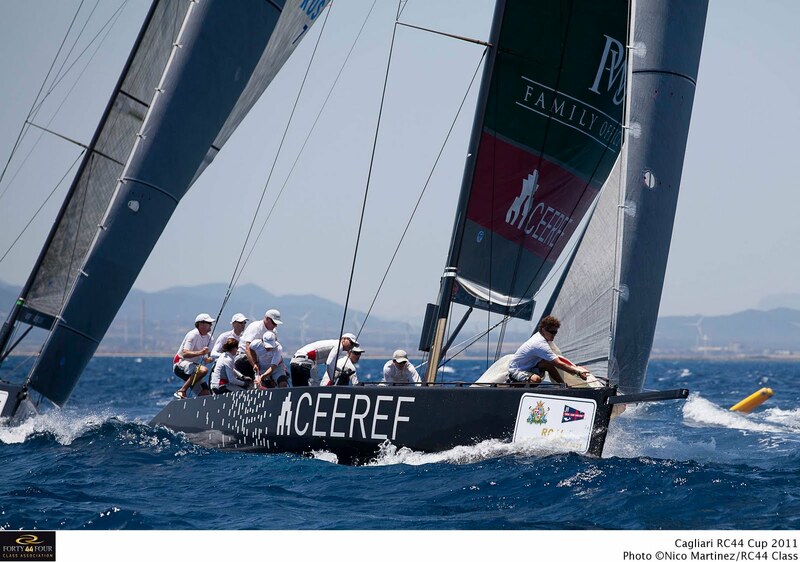 Eleven teams measure themselves in the 3-4 men keelboat class and fight for the Europa Cup. There are five teams from Poland amongst others. They're back - three years after their first German Open: the Platu 25. From the 7th to the 10th of July, the Platu 25 class invites the audience to the German Open in Warnemuende. Sven-Erik Horsch from Hamburg and his crew attend the event right after winning the Kieler Woche 2011. 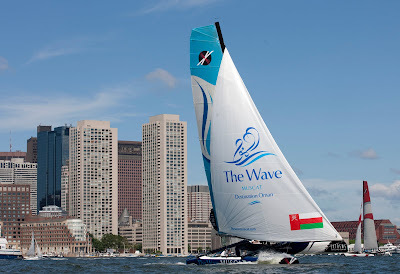 The One Design class, which is very popular in Europe, is sailed by four to six male or female sailors in a regatta; the boat is 7,50 meters long. Traditionally, the offshore highlight is the "hanseboot Rund Bornholm" regatta. 55 ships attend this year's 270 sea miles long regatta track – including the Volvo Ocean Racer "Illbruck", which also has the byname "Glashäger" nowadays due to their sponsor's name. It remains to be seen, if skipper Matthias Huhn and his crew are able to be faster than 28 hours and 37 minutes, the record which was set in 2001. "We wanted to improve the service for the sailors ashore and achieved this with the new concept of space. ", Lennart Klemp, the new chairman of the organization committee (OK), states. He is voluntarily dealing with the issues of the international sports event since July 2010. For instance, the courtyard of the sports school is reserved for the sailors this year, cars are banned from the direct port area to arrange more space for loading and unloading the ships. The jury, the race office and the infopoint are located directly under the pent roof, vis à vis the sports school. There is also an innovation in the park and camping area – which is organized by the Hanseatic City of Rostock. Areas will be allocated by the WIRO. The top sailing place to be this year is the hanseboot Event Area on the marina Mittelmole. While having a cool drink here, the regatta results of the day can be discussed. At the same time it is also the central point for all sailors to meet with other sailors and to celebrate! The big hanseboot party takes place on the second Saturday. But the hanseboot Event Area is not just about partying, laughter and chatting – the festival tent on the area of the Warnemuende Sailing Club at the Alter Strom is also the place of the prize giving ceremonies. But not all that glitters is gold this year – the winners are awaiting a new, very attractive prize made of glass. Even the best six are awarded in the bigger classes, not only the best three of the ranking list regattas. The new glass prizes are given to the group winners of the sea regattas as well as numerous challenge cups in the different classes and consolation prizes. The majority of the award ceremonies take place in the hanseboot Event Area. However, the winners of the 2.4mR class are awarded right at the jetty of the marina Hohe Düne. The surfers get their prizes in the media tent. Traditionally, the participants of the long distance regatta Rund Bornholm accept their awards on the stage at the lighthouse in front of the cheering audience. 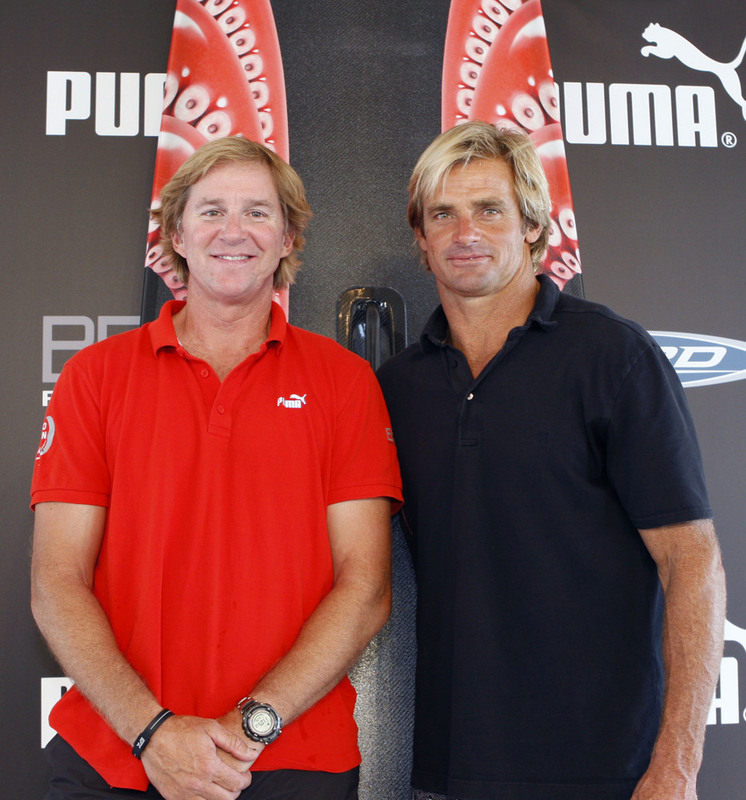 Ken Read (left), PUMA skipper, and Laird Hamilton. Image copyright Dan Armstrong/PUMA. Californian Hamilton, 47, made his name for his daring feats on a surfboard and he remains one of the fittest surfers so made the perfect choice for PUMA's Read, a spokesman said in Newport, Rhode Island. As part of the crew, he will be the official fitness and nutrition coach and join Read for the training of the team ahead of the race which starts in Alicante, Spain on 29 October. Mar Mostro. Image copyright Dan Armstrong/PUMA. "There's a great reason to have Laird around. The amount of times that somebody has told me when I said I was going to do this (the race) again that I was crazy but Laird is by far crazier -he makes me look sane," joked Read. "Seriously, he brings special things to us. He really knows the ocean." 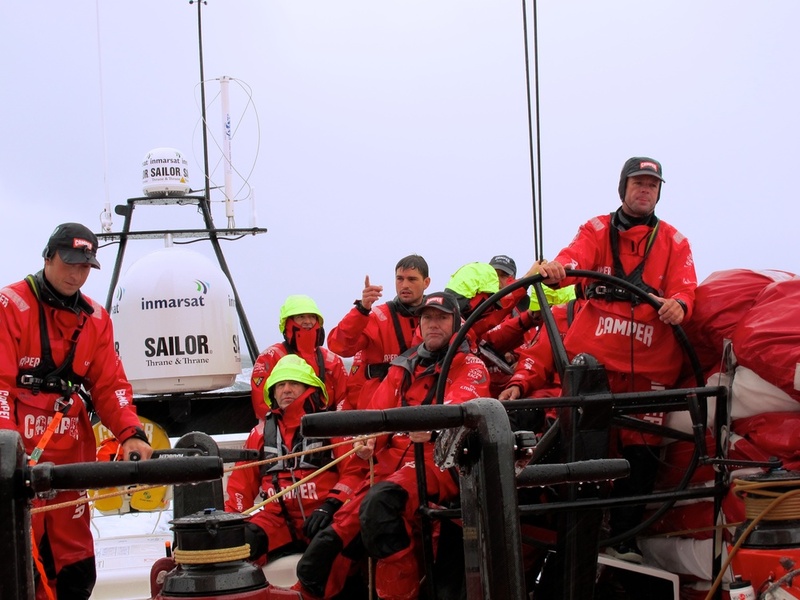 Hamilton told volvooceanrace.com that although he had not known Read long they had already formed a strong bond. "Even though we are from different sports we have so much in common," he said. "I think top sportsmen from different pursuits have more in common with each other than they do with people from their own sports who are a little further down the pecking order." Although he said the PUMA crew were already in good shape he thought they could benefit quickly from his knowhow. "Especially in nutrition. I have been eating and doing the right things for my body since I was a kid. It's natural to me. I have always lived this way. "Not everybody has been so lucky and I want to pass that on." Fitness and strength have become much more important in the Volvo Ocean Race in recent years with all participating crews adding a strict daily regime to the rest of their training routines. Hamilton is also known as one of the top proponents of paddleboarding and he has designed a new hi-tech, standup version to mark his partnership with Read's Volvo Ocean Race challenge. Commodore Garry Linacre today sent a message to all members of the Cruising Yacht Club of Australia informing them the Coronial Inquest into the Flinders Islet incident was held today before Deputy State Coroner Carmel Forbes at the Parramatta Local Court. The report, prepared by the NSW Police, investigating the incident was formally tendered to the court. Included in that report was the Flinders Islet Yacht Race Internal Inquiry report* prepared by a Committee constituted by the CYCA board. In handing down her findings, Deputy State Coroner Forbes was unable to make any recommendations that could prevent further accidents from occurring in the future and determined the official cause of death of both Andrew Short and Sally Gordon was drowning as a result of a boating accident. Commodore Linacre took the opportunity on behalf of all members of the Cruising Yacht Club of Australia to emphasize the sympathies of the Club remain with the families of Andrew Short and Sally Gordon and re-emphasized his gratitude to the members of the Flinders Islet Internal Inquiry Committee chaired by Chris Oxenbould AO RAN (Rtd). The Coroner was made aware by counsel assisting her inquiry that the recommendations made in that report had been adopted by the Club. He also stated: “Although this concludes the formal investigation into the incident which occurred in the early morning of 10 October 2009 resulting in the tragic deaths of Andrew and Sally, our memories of them both will last forever”. The CYCA Internal Inquiry report* into the incident can be found at the CYCA website via the following link. This report was shared with a number of interested parties when it was published in February 2010, including the families of Andrew Short and Sally Gordon, NSW Police conducting the official investigation, NSW Maritime, Marine Rescue NSW, Yachting Australia, Yachting NSW and yacht clubs around the country that share similar ocean yacht racing objectives. 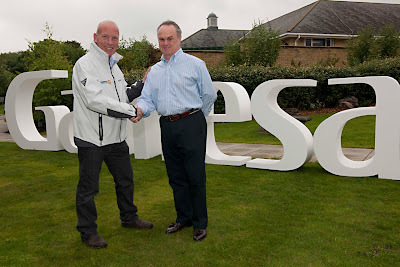 Jorge Calvet, Chairman and CEO of Gamesa with Mike Golding OBE, at the presentation of the sponsorship in Windsor, London. 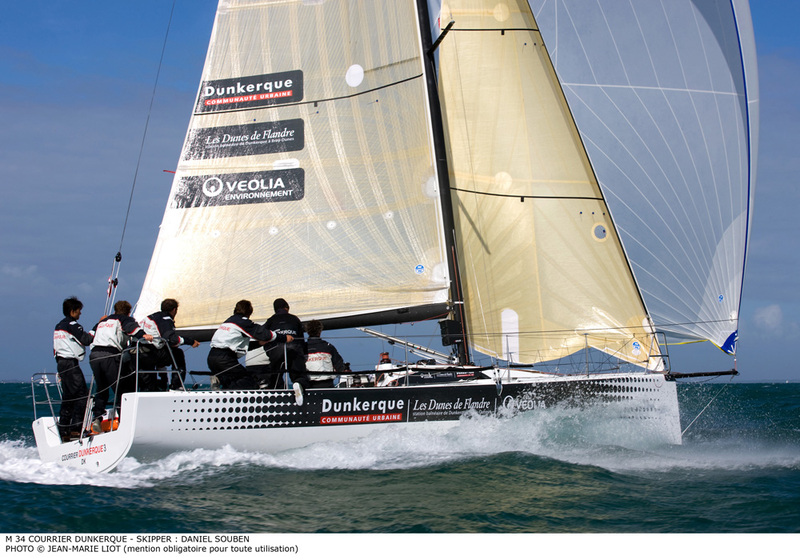 I’m delighted to announce that I will be rejoining the IMOCA Open 60 circuit in partnership with Gamesa, and will be on the start line for the 2012 Vendée Globe with our newly optimised Owen Clarke IMOCA 60, Gamesa. Gamesa is the global technology leader in the wind industry and will become Title Partner of the Gamesa Sailing Team with the non-stop, solo around the world race, the Vendée Globe being the primary event of this new sailing partnership. 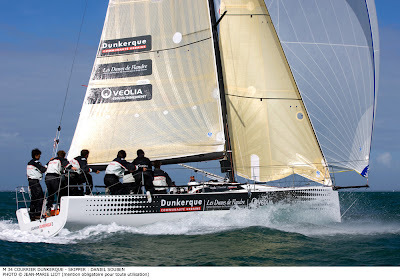 We have a very exciting and busy 18 months ahead, with our first race the two-handed Transat Jacques Vabre from France to Costa Rica in October and a fully crewed Europa Race (a tour of Europe) in May 2012. With Gamesa’s support and our existing infrastructure we are now certain to be able to mount a competitive campaign for the Vendée Globe, which is simply wonderful news. Having enjoyed huge success in the sport, the Vendee Globe remains ‘the event’ I would most love to win and now I have that chance! Having spent the past decade championing environmental products and issues, it’s fantastic that Gamesa’s core business is in renewable energy – an area increasingly critical to performance in competitive round the world yacht racing. Mock-up of Mike Golding's Gamesa IMOCA 60. 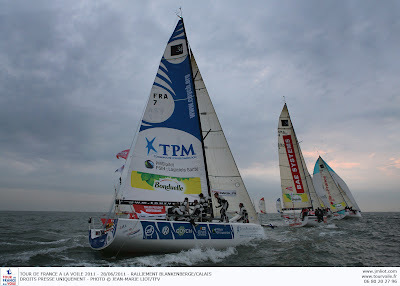 Image copyright Mike Golding Yacht Racing/Gamesa. Our Owen Clark designed Open 60 is currently undergoing major optimisation work at Green Marine in the UK, with a view to being on the water and sailing again later this summer. You can find out more about this new partnership here: [insert weblink to news article about announcement] and please join our new Facebook page http://www.facebook.com/mikegoldingyachtracing so you can be the first to find out about the latest news from the Gamesa Sailing Team. Thank you for your continued support and I look forward to updating you on our progress. 2003 Transatlantic Race start. Image copyright Rolex/Daniel Forster. Having cheered on the first six yachts when they departed on the Transatlantic Race 2011 two days ago, the 14-strong group of yachts that will take the second of the three staggered starts now have less than 24 hours until they begin the race across the North Atlantic for themselves. The warning signal at 13:50 Eastern Daylight Time on Wednesday, June 29, will cue the largest group of yachts to depart, including the show-stopping Maltese Falcon, and spectators are guaranteed to see a unique sailing spectacle when the cannon is fired at Castle Hill Light. Without doubt, tomorrow’s start will feature the most diverse battle of the race. The Open Class has just two yachts, but they are two of the showiest yachts in the race. Maltese Falcon, at 289’, is the largest yacht competing and is up against the only multihull entered in the race, Phaedo, the Gunboat 66 owned by Lloyd Thornburg (St. Barthelemy). The Lamborghini-orange catamaran and the futuristic Perini Navi will be a spectacular sight as they head off into the Atlantic. In IRC Class Two, Jazz, a Cookson 50, has a star-studded crew including the highly experienced navigator, Mike Broughton (Hamble, U.K.), and skipper, Nigel King (Lymington, U.K.). Unfortunately, due to family commitments, owner Chris Bull is unable to make the trip. Two German teams on nearly identical yachts will also go head-to-head in the class: Christoph Avenarius and Gorm Gondesen’s Shakti and Jens Kellinghusen’s Varuna should virtually match race across the North Atlantic. IRC Class Three will feature six yachts, including Snow Lion, the Ker 50 owned by former NYYC Commodore Lawrence Huntington (New York, N.Y.). Snow Lion is a proven winner, having won her class in the Newport Bermuda Race, and should be highly competitive on corrected time. There are, however, some real fliers in this class, not the least of which is Zaraffa, the Reichel Pugh 65 owned by Huntington Sheldon (Shelburne, Vt.), whose crew includes several veterans of the last edition of the Volvo Ocean Race. The Volvo 60 Ambersail, skippered by Simonas Steponavicius (Vilnius, Lithuania), is a much-travelled yacht having logged over 100,000 miles since being purchased in 2008 to celebrate a thousand years of Lithuanian history. After sailing around the world, Ambersail took part in the 2010 Sevenstar Round Britain and Ireland Race, winning class honors and placing second overall. The youth entry from Germany, Norddeutsche Vermoegen Hamburg, will be helmed by Eike Holst whose third Transatlantic Race will be his first as skipper. And while the majority of the team aboard the Andrews 57 are university students in their 20s, two of the crew are just 18 years old. Many of sailors in the race were introduced to the sport as a family activity, which means the parents of these sailors, in particular, have a degree of understanding and ease with the undertaking at hand. That was not the case for Jerome Vigne, the Parisian-born mechanical engineering student who will have a very relieved mother welcoming him home to Germany. Blending a comfortable interior with the performance of an Open 60 is Ourson Rapide, the Finot-Conq 60 owned by Paolo Roasenda (Vedano al Lambro, Italy). This is a special boat that should have a dream-like ride downwind. Scho-ka-kola, named for the German chocolate confection, is a Reichel Pugh 56 owned by Uwe Lebens (Hamburg) that has completed two previous Atlantic crossings. Prodigy, a Simonis/Voog 54, is a proven winner. 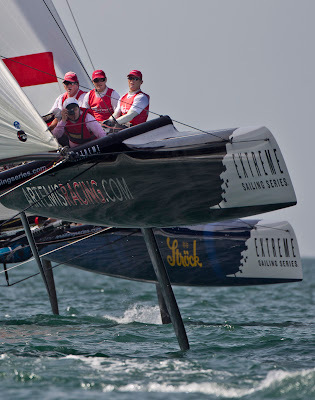 Owner Chris Frost (Durban, South Africa) took line honors in the 2011 Heineken Cape to Rio Race and will compete in the Rolex Fastnet Race, as well as the Rolex Middle Sea Race, as part of a year-long campaign. Of the 10 crew on Prodigy, two – including Aaron Gillespie (Butler, N.J.) and John Fryer (New York, N.Y.) – were recruited by Frost using the “Crew Finder” feature on the event’s website. It will be Gillespie’s first Transatlantic crossing. The two smallest yachts in start two are both Class 40s: Dragon and Concise 2, the latter skippered by Ned Collier-Wakefield (Oxford, U.K.). Tony Lawson (Haslemere, Surrey, U.K.) assembled a crew of young aspiring sailors from Great Britain to make up Team Concise. The team has become a force to be reckoned with having won the 2009 Class 40 World Championship, set a world record for the Round Britain and Ireland course and taken class honors at the RORC Caribbean 600 for the last three years. 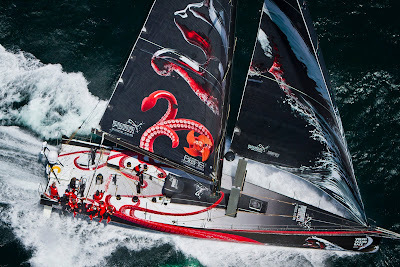 Dragon is the only boat racing across the Atlantic double-handed. Owner Michael Hennessy (Mystic, Conn.) has been an avid sailor ever since introduced to the sport by his father at the age of four on San Francisco Bay. Following college, Hennessy logged thousands of miles cruising along the New England coast before he started to focus on short-handed distance racing in 2002. Since then he has competed in four Newport Bermuda Races, as well as dozens of other races across New England. In 2008 he took notice of the fast growing Class 40 fleet and took delivery of his Owen Clarke-designed boat. In just two short years, Dragon has become a fixture on the ocean racing circuit. Joining Hennessy will be co-skippered Rob Windsor (East Northport, N.Y.) who grew up sailing with his family on Long Island Sound. Team CEEREF. Image copyright Nico Martinez. Round three of the RC44 Championship Tour and the fleet are heading to the Med following on from the first two events of the season in San Diego, USA and Lake Traunsee, Austria. The class have twice visited Cagliari before making their debut in 2008 and returning in 2009. Located deep in the heart of Cagliari Bay on Sardinia’s beautiful south coast, the venue boasts strong and consistent breezes that are bound to challenge the 15 teams ready to challenge for the RC44 Cagliari Cup. Racing will take place in front of the spectacular Bay of Angels, very close to Cagliari port, with one day of match racing kicking off the proceedings on 29th June, followed by four days of fleet racing. (29 June – 3 July). Alberto Floris, President of Yacht Club Cagliari, said the town is looking forward to welcoming the Tour to its shores once more. One to watch will be Michele Ivaldi (ITA), tactician onboard Team CEEREF, an experienced Olympic and America’s Cup sailor, having competed for Italy in the 1996 Olympic Games and with Luna Rossa/Prada for three America’s Cup cycles. Cagliari is a venue that Ivaldi has raced at many times and is looking forward to welcoming the Tour. “Cagliari is one of the best places to sail and I've been going back there for years and years, I was there in a 420 when I was 16 years old. It's always had a good sea breeze and when the Mistral comes in, it’s game on. I'm really looking forward to the sailing.” Michele Ivaldi, Tactician, Team CEEREF. Two new teams, MAG Racing from Poland and RUS-7 Sail Racing Team powered by AnyWayAnyDay.com have joined the RC44 Tour ahead of Cagliari. Although they will not be challenging for the title this year, with all six events of the Tour counting for the overall title, they will already be preparing for their assault for 2012. In the overall Tour standings ORACLE Racing (USA) leads the title race after two events, following their victory at the RC44 Austria Cup in May. But they will need to watch out for Chris Bake’s Team Aqua (GBR), who launched their brand new RC44 on Lake Traunsee in Austria last month. Team Aqua also lead the Match Race rankings and are just two points adrift of the leaders in the fleet race standings. 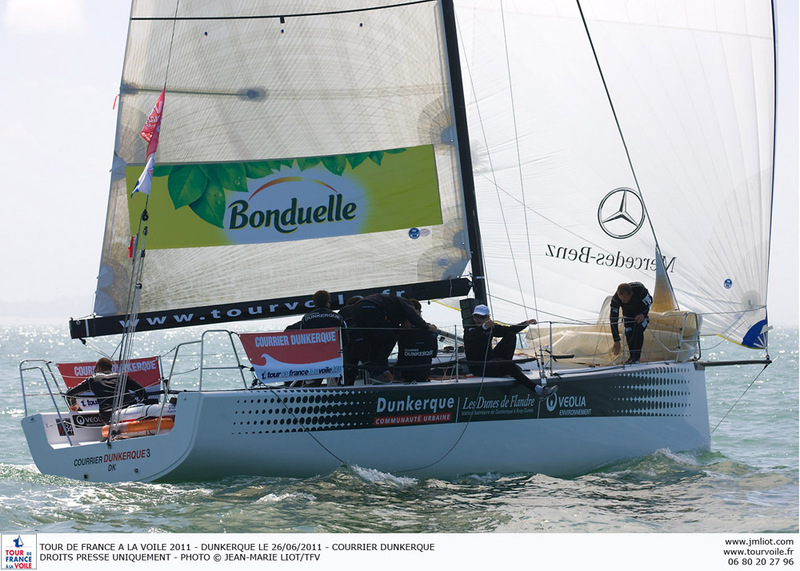 Katusha (RUS) skippered by Paul Cayard are two further points behind in third. With new faces and teams joining the Tour at each event this season, nothing is a given and it will be all to play for in the Bay of Angels. M34 Nantes St Nazaire – E.Leclerc. Supplied image. 2011, « une année pour voir » ne cesse de répéter Corentin Douguet, le skipper du bateau Nantes St Nazaire – E.Leclerc. Apparemment l’équipage de l’APCC Voile Sportive apprend vite, très vite même. Le second ralliement du Tour de France à la Voile, qui s’est déroulé cette nuit entre Blankenberge et Calais, a montré que le « bateau-éléphant » n’était pas venu faire de la figuration, loin de là. Après un départ moyen et un passage à la bouée de dégagement à la 13ème place, les nanto-nazairiens ont effectué un retour spectaculaire jusqu’au 6ème rang, au lever du jour. L’expérience des 3 Figaristes du bord (Jean Pierre Nicol, Corentin Douguet et Charlie Dalin) a beaucoup aidé sur cette étape et notamment sur les longs bords de « reaching ». Les jeunes régatiers du club nantais se sont surpassés alors que pour certains, c’était la première fois qu’ils naviguaient de nuit. Lors du briefing précédant le départ, Corentin Douguet avait rappelé à son équipage la nécessité de garder de la fraicheur pour les derniers miles du parcours. Son discours a parfaitement été entendu car sur le dernier bord du parcours, dans des conditions pas évidentes (18 nœuds de vent au portant), le Nantes St Nazaire Sailing Team a réussi à chiper la 5ème place au bateau barré par un certain Bertrand Pacé, le tenant du titre. Il suffisait de regarder les visages des 8 marins pour comprendre avec quelle énergie ils s’étaient battus tout le long de la nuit. Les traits étaient tirés mais c’est avec le sentiment du devoir accompli qu’ils ont confié le bateau aux préparateurs, avant de gouter à un repos amplement mérité. Comment s’est déroulée le ralliement entre Blankenberge et Calais ? Corentin Douguet : On est parti de Blankenberge dans du tout petit temps. On été un peu sous les orages donc c’était très instable. A la bouée de dégagement on est assez mal placé mais après, dans le petit temps, quand on a envoyé le grand spi, on a empanné quasiment les premiers ce qui nous a permis de revenir dans le groupe de tête. En début de nuit le vent a tourné, passant du secteur Est au secteur Nord Ouest en quelques secondes seulement. A ce moment la heureusement on avait réussi à se remettre dans le match parce que le vent est rentré par devant donc les bateaux de tête se sont un peu échappés. Du coup on se retrouve au « reaching », 6ème mais avec les 5 premiers qui ont pas mal d’avance. Nous, on est premier du groupe de poursuivants. Mais petit a petit on a grignoté sur le paquet de devant. Et après la dernière bouée avant Calais, il fallait envoyer le grand spi pour un bord un peu musclé, et sur ce bord là on a réussi à passer Sud de France et on termine 5ème. Quelle a été l’ambiance à bord pendant cette étape de nuit ? Corentin Douguet : Ca c’est vraiment bien passé à bord. Il y avait une bonne ambiance et un super état d’esprit. On a tous rien lâché. Chacun a fait son maximum pour faire avancer le bateau le plus vite possible. Après au niveau de la vitesse, le premier bord de près, sous génois léger n’a pas été facile mais par contre, au « reaching » dans pas mal de vent, on allait vite. La preuve, on a réussi à distancer un bateau comme Courrier Dunkerque pour aller recoller à des bateaux comme Crédit Mutuel de Bretagne ou Sud de France. Du coup au final on gagne une place au général et on attend impatiemment de voir la suite. Tour de France à la Voile : Courrier Dunkerque imprime sa marque ! L’équipe menée par Daniel Souben est, en train, de tirer les fruits de sa préparation d'avant-saison. Les marins nordistes sont, sans aucun doute, les plus entraînés du plateau sur le nouveau M34. Avec plus de 40 jours de stage à l’Ecole Nationale de Voile de Quiberon, la bande à Souben démontre en ce début de compétition sa bonne connaissance de son unité et surtout une homogénéité à bord. Voilà maintenant quasi quatre ans que cet équipage navigue ensemble. Autour du manager Daniel Souben, c’est tout un team de haut niveau qui se mobilise pour accéder au meilleur ! La route est encore longue mais, force est de constater, que pour l’instant les navigateurs de « Dunkerque Plaisance » sont plus à l’aise sur l’eau que leurs concurrents. L’une des nouveautés du Tour de France à la voile avec l’arrivée d’un nouveau voilier, le M34 et un passage en Belgique, est l’obligation pour les équipages, notamment « Courrier Dunkerque », d’embarquer à bord lors des compétitions au contact ou au large, deux équipiers de moins de 26 ans. Après quelques sélections, Daniel Souben, skipper du bateau de l’association « Dunkerque Plaisance » a décidé d’accueillir deux équipiers étrangers. L’australien Matt Hodgson, qui réside en Suède, a déjà beaucoup navigué notamment à bord de l’hydroptère. Le britannique James Williamson vient du circuit mondial de Match Racing. Deux recrues de choix qui renforceront, sans conteste, l’équipe dunkerquoise dès les premières étapes. Départ ce soir à 21h30, 55 milles devant l’étrave du fier « Courrier Dunkerque », direction la cité des six bourgeois, un ralliement difficile avec des conditions orageuses annoncées. « Cela va être instable ! » selon Daniel Souben. « Il faudra jouer avec le courant. Nous attendons deux renverses. Il est possible qu’il y ait quelques passage à niveaux avec des équipages qui loupent le changement de marée ». 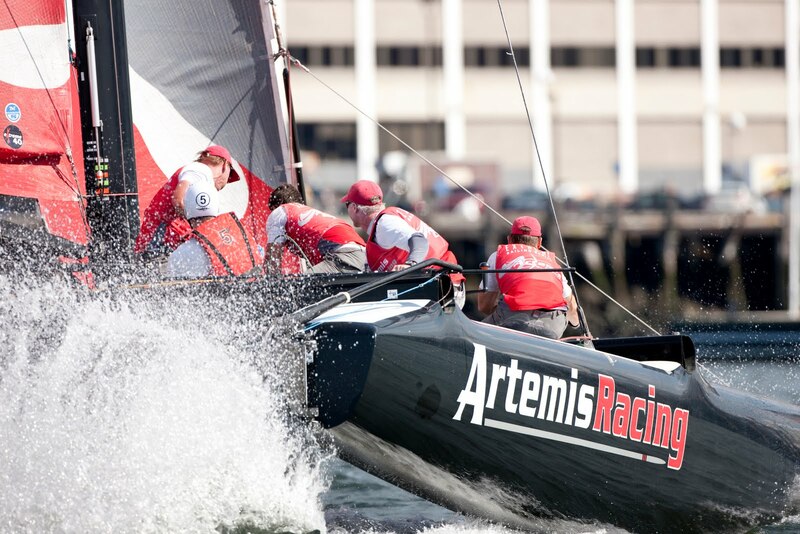 Extreme 40 : Extreme Sailing Series Act 4, Coming to You Live From Boston! For the first time, every minute of the racing action from Act 4 of the Extreme Sailing Series in Boston will be available live on the internet. Sailing Anarchy’s innovative “On-The-Water Anarchy” team will produce and stream coverage of all five days of racing, and their coverage will include the Extreme 40 and 49er racing action, the opening press conference, daily prizegivings, numerous interviews, and a daily live talk show with the sailors. Racing commentary will be by two-time US Multihull Champion John Casey. The streaming video feed will also be available to iPhone, iPad. Android users via the dedicated Justin.TV app [download fee applies]. The Extreme Sailing Series Race Village at Fan Pier, the 21-acre site on Boston’s waterfront spanning nine city blocks, owned by the Fallon Company, the official host venue partner to the Boston Act, is rapidly under construction for the public and VIPs. 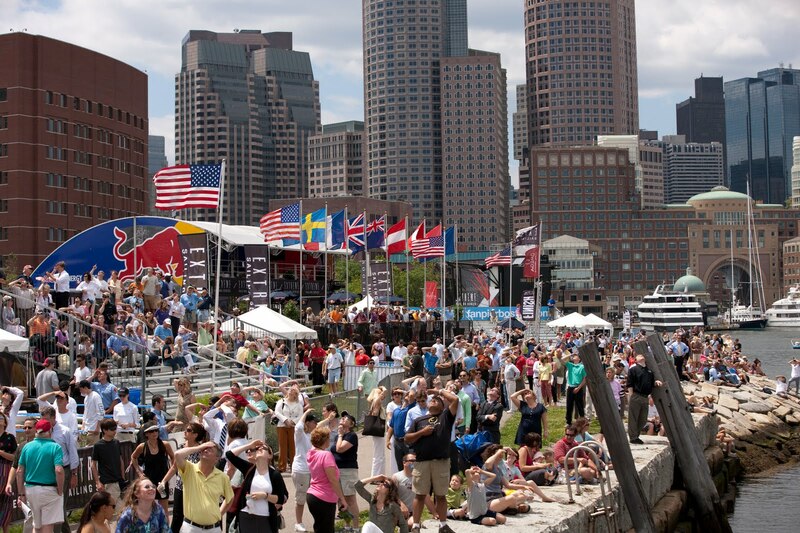 Every day of the Boston five-day event – the first time the circuit has held an official event in the USA – from Thursday, 30th June until Monday, 4th July is open to the public and is part of the Boston Harborfest – the nation’s largest 4th July celebrations. Two other American sailors Bob Merrick and Mark Ivey will be competing alongside the 11-boat Extreme 40 crew in the Boston Act. Merrick, who won a silver medal in the 470 dinghy class at the 2000 Sydney Olympics, will be joining the crew of Roland Gaebler’s Team Extreme; whilst Mark Ivey, ISAF Team Race World Champion in 2005 and US Sailing Coach of the Year 2009, will be racing with Britain’s Ian Williams on Team GAC Pindar. And Red Bull Extreme Sailing, headed up by two-time Olympic gold medalist Roman Hagara, carries the mantle of ‘home’ team as Red Bull come on board as the main local event partner to the US event, heavily promoting the team and the event in and around Boston. And if visitors cannot make it to Fan Pier they can catch up on all the latest action via Fox TV 25 who will be broadcasting live from the Race Village on Thursday and Friday (see schedule below) including coverage of the Red Bull Air Force skydivers. Other crew changes of note are Leigh McMillan taking over as skipper of The Wave, Muscat, Adam Beashel tactician for Emirates Team New Zealand at the 2007 America’s Cup sitting alongside Dean Barker, and Andrew Walsh joining Team GAC Pindar as tactician bringing with him some valuable experience from his days racing the BT Extreme 40 in previous years. 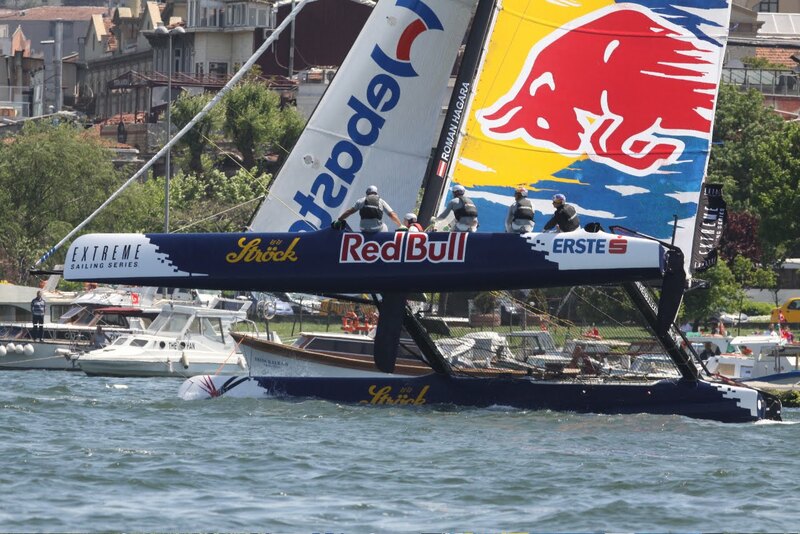 Extreme 40 action in Istanbul. Image copyright Mark Lloyd/Lloyd Images/OC ThirdPole. Fan Pier, Boston sailing venue. Image copyright Fan Pier Boston. 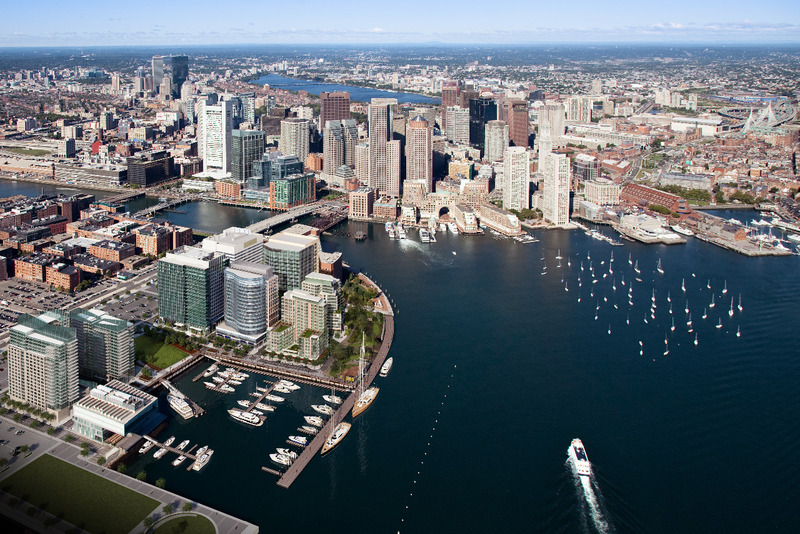 Fan Pier is a 21-acre site on Boston’s waterfront spanning nine city blocks with over three million square feet of planned mixed-use development. Currently, the luxury waterfront property is home to the internationally acclaimed Institute of Contemporary Art, famed Boston retailer LOUIS, Salon Mario Russo and restaurants including Sam’s and Strega Waterfront. Fan Pier’s first office building at ONE Marina Park is already occupied, and the destination includes a new public park, a Harbor Walk, and a state-of-the-art marina. When complete, Fan Pier will have a five-star hotel, luxury condominiums, additional offices, retail and restaurants. The Fallon Company is owner and developer. 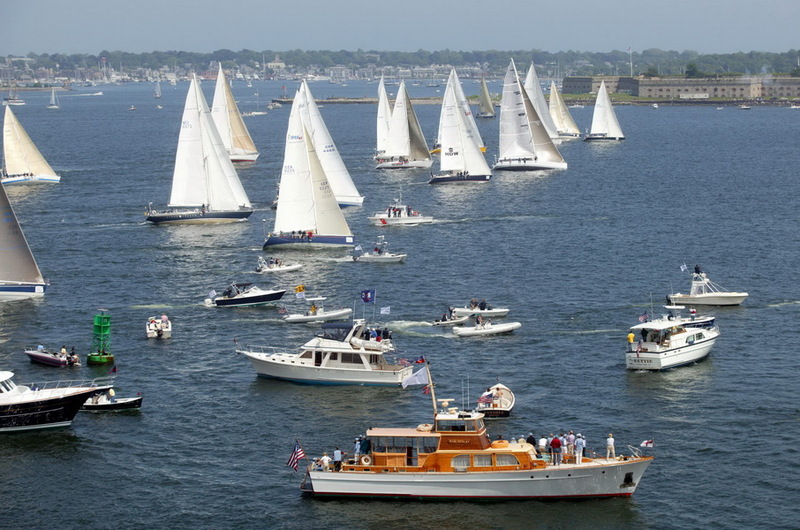 Boston Harborfest 2011 is a six-day long Fourth of July festival that showcases the colonial and maritime heritage of the cradle of the American Revolution: the historic City of Boston. The award-winning festival strives to honor and remember the past, celebrate the present, and educate the future with reenactments, concerts, historical tours and much, much more. Now in its 30th year, Boston Harborfest is considered to be the largest patriotic celebration in the nation with visitors enjoying more than 200 activities during the festival. Journée chargée pour les quinze M34 : avant de partir ce soir à 21h30 pour rallier Blankenberge à Calais, les équipages se sont mesurés cet après-midi sur un parcours banane deux tours de coefficient 1. Une manche technique car la zone de course offrait un vent de Nord-Est faible et instable. Aujourd’hui, l’enjeu consistait donc à chasser la moindre risée ! Après une longue attente à terre toute la matinée en raison d’un vent aux abonnés absents, les concurrents ont pu quitter les pontons vers 12h30. Le premier départ est sanctionné d'un rappel général. Pas de gaspillage de temps cet après-midi, le comité sait, au vu des prévisions météo, qu’il a une toute petite fenêtre pour pouvoir lancer une manche. Le bateau comité hisse donc le pavillon noir. Gérald Véniard, navigateur sur BAE Systems lors des parcours de ralliement et figariste à ses heures, observe la course depuis le bateau presse. « Sous pavillon noir, ils font moins les marioles ! La flotte est vraiment alignée sur une même ligne» commente t-il amusé. Effectivement, le second départ est le bon pour l'ensemble des M34, qui tire des bords pour rejoindre la bouée au vent, mouillée à 0,9 mille, dans le 35°. Courrier Dunkerque, qui arbore le spi rouge du leader, enroule la bouée en premier, suivi de Sud de France / Languedoc-Roussillon et Toulon Provence Méditerranée. Mais dans ces conditions instables, la moindre risée peut redistribuer les cartes. Safran-Multiplast, leader du classement amateur, gagne du terrain. A l'arrivée, l'équipage de Julien Villion décroche une seconde place derrière Courrier Dunkerque, et laisse dans son sillage Sud de France / Languedoc-Roussillon (3ème), et Toulon Provence Méditerranée (4ème). Si Courrier Dunkerque passe la ligne d'arrivée, sous spi, et en tête de la flotte, les derniers bateaux doivent affaler, faute de vent. Six monotypes* ne terminent pas la course car ils n'ont pas réussi à franchir la ligne d'arrivée avant l’heure limite fixée à 15h59. Ce soir, Courrier Dunkerque reste leader au classement général. Pas de changement non plus pour Toulon Provence Méditerranée, qui conserve sa deuxième place. Safran-Multiplast remonte à la troisième place. Leader du classement amateur, ces jeunes semblent très à l'aise sur les parcours banane. Ile de France, 5ème aujourd'hui, descend d'un cran dans le classement pour occuper la 4ème place. De retour à Blankenberge, les équipages n’ont pas trainé pas sur les pontons. Ils n'ont que quelques heures pour se reposer, avant le départ à 21h30 de la seconde étape de ralliement de 60 milles nautiques, qui sépare Blankenberge de Calais. Les M34 devraient quitter la Belgique avec un vent de secteur Nord d'une dizaine de noeuds, qui pourrait forcir jusqu'à 20 noeuds dans la nuit. « Ce sera un parcours en route directe au reaching. Le principal piège sera donc la météo incertaine en raison du passage d’un front froid instable qui se dirige vers l’Angleterre. Cela contraindra les équipages à anticiper les réglages et les changements de voile » explique Christophe Gaumont, directeur de course. Les premiers bateaux sont attendus en fin de nuit à Calais. * : Batistyl Ville de Pornic, Côtes d’Armor Bretagne, Ile de la Réunion-Ville du Port, Iskareen, Région de Bruxelles-Capitale - Brussels Hoofdstedelijk Gewest, Martinique Centrale PariS HEC.